Just how absurd have American development patterns become over the past few decades? Behold: Two houses with adjoining backyards in suburban Orlando. 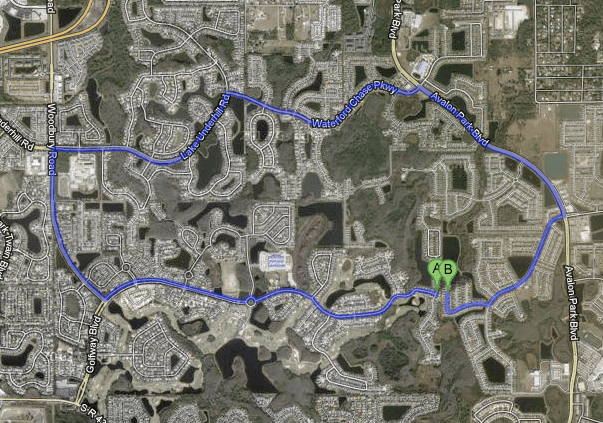 If you want to travel the streets from point A on Anna Catherine Drive to point B on Summer Rain Drive, which are only 50 feet apart, you’ll have to go a minimum of seven miles. The trip would take almost twenty minutes in a car, according to Google Maps. Windy street patterns, full of cul-de-sacs and circles, have become such a ubiquitous feature of the suburbs that they mostly escape remark. But disconnected streets have many insidious consequences for the environment, public health, and social equity. For one, the lack of a functional street grid funnels traffic onto wide arterial roads — which tend to be the most dangerous places for pedestrians. Furthermore, disconnected streets discourage trips by foot or bike. People who can drive have no incentive to walk or bike anywhere because the trips would be too long and dangerous, while people who can’t drive are effectively trapped in their own homes, or are highly dependent on caretakers. A major source of the problem, CNU points out, is that current transportation engineering and funding conventions favor building individual segments of roads, as opposed to a network of streets. In 2009, CNU even had legislation supporting street networks at the federal level inserted into the CLEAN-TEA transportation bill, which died along with the climate bill that year. In the meantime, CNU has been offering trainings on their Street Network Principles to local communities and transportation professionals. Ultimately, CNU planner Heather Smith says, they are interested in getting the principles adopted into policy at all levels of government. Someone with influence in suburban Orlando needs to take that course. WINDY? Windy refers to the wind blowing, not a WINDING road. Someone needs to fact check before playing Mr. Pedantic. Someone needs to Google a little harder before playing Grammar Cop. The dictionary is not a rulebook. It is a usage guide. The word, windy, is both an adjective that is a synoynm for the adjective, winding. I believe that originally the only correct form was winding; however, language does evolve over time. (Of a road or river) following a curving or twisting course. I know that you’re likely sticking to your guns. I also agree that winding is the choice of pedants everywhere; however, it’s just not the only accepted usage. Exactly. A guide to correct usage. Period. Well then we are in agreement. There’s a definition of windy in at least two dictionaries matching the usage in the article, therefore the usage was correct. Period. Full stop. We are in agreement that you are illiterate, that is correct. You can find “fo’ shizzle” in an online dictionary, also. Feel free to use it on your resume, if you ever get employed. It’s axiomatic that neither of us are illiterate, so you only discredit yourself with that line of argument. Winding is indeed the far more common adjective–probably by several orders of magnitude; however, windy is acceptable in this useage. Windy, as in meandering or twisty, goes back to at least the late 1800s. I sympathize with your angst in the matter, but personal feelings do not decide acceptable useage. The next time you’re churning your butter and spinning your loom you can feel free to use the incorrect archaic term ‘windy’. The rest of us in the modern world will continue to use proper English and try not to laugh at your anachronistic contumaciousness. “Goes back to at least the late 1800s” does not mean windy is anachronistic, archaic, or incorrect any more so than winding whose origins go back further to the early 1700s. Again with the attacks rather than actual discourse, do you have nothing constructive to contribute? Actually, that’s exactly what it means despite your tortured attempts at circuitous syllogism. Matt Barnes is a twicebone! Good point! Reminds me of that part in Ferris Bueller’s Day Off, in which he is racing through the suburban backyards. It would still be better to have a few more official road and footpath connections though, in mine opinion!! Prohibiting short car trips is a desirable goal for a residential community. The trouble is there are not shorter foot or bicycle-only routes to capitalize on that. you knew what he meant and that’s really the only thing that matters. why pick at poor wording? have you nothing better to do? Correcting ignorance is its own reward. The cruellest thing about this is that both those houses are in Phoenix. I was in Orland once as a kid. While driving to Universal Studios I could see the park and rides from across a field and it looked only about a mile or two away. It took us another hour before we reached the front entrance. I was seriously confused by that. Phoenix is a great city for street layouts. All the major roads are on a square grid, while the neighborhoods inside those grids are laid out more haphazard web style to discourage people who don’t live there from taking shortcuts through residential areas. So in Phoenix it’s very easy to find your way around, but if you turn into the wrong neighborhood you’ll easily get lost and end up being spat back out onto a main street not too far away. You’re actually very far off the mark, since gates between properties might actually be prohibited by ordinance in modern suburbs/exurbs (actually that seems fairly likely, since they prioritize privacy at all costs in most backyards). Additionally, the neighborhood Ferris runs through is an older, affluent suburb of Chicago. I live in a 1920s suburb on New Orleans and the whole neighborhood was laid out on rear alleys, with low chain fences dividing individual properties and gates between adjacent properties AND onto the alley. This wasn’t something that was done after-the-fact, it was just normal. And if you didn’t want people to be able to use the gate, you could put a lock on it, simple as that. You might find that a lot of those originated as Roman encampments, as the urban grid originated with them.